The President is kept informed by the Prime Minister of Pakistan on all matters of internal and foreign policy, as well as all legislative proposals. The Constitution vests the President with the powers of granting pardons, reprieves, and the control of the military; however, all appointments at higher commands of the military must be made by the President on a "required and necessary" basis, upon consultation and approval from the Prime Minister. In addition, the Constitution prohibits the President from exercising the authority of running the government. Powers to exercise the authority are limited to the ceremonial figurehead, and required to address the Parliament to give a direction for national policies before being informed of its key decisions. In addition, the President is also a civil commander-in-chief of the military, with Chairman joint chiefs being its chief military adviser to maintain the control of the military. After a thorough confirmation comes from the Prime Minister, the President confirms the judicial appointments in the national court system. In addition, the Constitution allows the President to grant pardons, reprieves, and clemency in cases recommended to him by the executive and the judiciary. The President himself has absolute constitutional immunity from criminal and civil proceedings, and no proceedings can be initiated or continued against him during the term of his office. From 2000 until 2009, the President was the chairman of the National Security Council who had authority and control over the nuclear and strategic arsenals; however, the chairmanship and the powers transferred back to Prime Minister. Furthermore, the presidential powers have significantly declined with Pakistan's government reversed to a parliamentary democratic republic. At least 45 years of age. Qualified to be elected as member of the National Assembly. Whenever the Aiwan-e-Sadr becomes vacant, the selection of president is done by the electoral college, which consists of both houses of Parliament (the Senate and National Assembly) and the four provincial assemblies. The Chief Election Commissioner has to conduct elections to the office of the President in a special session. Voting takes place in secrecy. Each elector casts a different number of votes. The general principle is that the total number of votes cast by members of Parliament equals the total number of votes cast by provincial legislators. Also, legislators from larger states cast more votes than those from smaller provinces. The actual calculation for votes cast by a particular state is calculated by dividing the state's population by numbers of seat, which is divided again by the number of legislators from the state voting in the electoral college. The constitution further states that election to the office of President will not be held earlier than sixty days and not later than thirty days before the expiration of the term of the President in office. The Speaker of the National Assembly of Pakistan. The President may be removed before the expiry of the term through impeachment. The President can be removed for violation of the Constitution of Pakistan. The impeachment process may start in either of the two houses of the Parliament. The house initiates the process by leveling the charges against the President. The charges are contained in a notice that has to be signed by either the Chairman or the Speaker National Assembly through a two-third majority. The notice is sent up to the President, and 14 days later it is taken up for consideration. A resolution to impeach the President has to be passed by the two-third majority. The Speaker National Assembly then summons the joint session not earlier than seven days. The President has the right to defend oneself. If the resolution is passed by the two-third majority at the joint session declaring that the President is unfit to hold the office due to incapacity or is guilty of violating the Constitution or of gross misconduct, then the President shall cease to hold office immediately on the passing of the resolution. No president has faced impeachment proceedings. However, the proceedings have been used in 2008 in an attempt to impeach former president Pervez Musharraf who tendered the resignation after the proceedings above were used. Following the new elections held in 1993, Prime Minister Benazir Bhutto established a strong government after appointing loyalist Farooq Leghari to the presidency. However, the corruption charges and the controversial death of Murtaza Bhutto in 1996 resulted in President Farooq Leghari dismissing Prime Minister Benazir Bhutto. In 1997, President Farooq Leghari could not overcome the heavy mandate bestowed on Prime Minister Nawaz Sharif by the public in 1997. President Leghari unsuccessfully supported Chief Justice Sajjad Ali Shah— both of them resigned, ending the conflict between the Judiciary, the Executive, and the Parliament. After appointing Rafiq Tarar, the Parliament successfully passed constitutional amendment to decisively limit the presidency. After staging a controversial self coup in 1999, General Pervez Musharraf dismissed Prime Minister Nawaz Sharif and President Rafiq Tarar in 2001 while assuming more powers to the presidency. In January 2004, the Electoral College elected Musharraf, and as a result he was, according to the Constitution, "deemed to be elected". President Musharraf's repeated unconstitutional intervention resulted in a standoff with the Judiciary, and declared a state of emergency in 2007, after dismissing the senior justices of the Supreme Court. Although Musharraf was elected in 2007, the constitutional legality of Musharraf's rule was found dubious. A populist constitutional movement eventually resulted in Musharraf's departure. On 22 August 2008, the electoral commission called for presidential nominations to be delivered by 26 August 2008 and for elections to be held on 6 September 2008. After the presidential election held in 2008, Asif Ali Zardari lobbied for constitutional amendment to restore the Constitution as it was in 1973. In 2010, the Parliament unanimously and with a large majority, passed the eighteenth amendment of the constitution. It revoked the presidential powers and changed Pakistan from a semi-presidential system of government to a parliamentary republic, with great hopes of governmental stability in the future. ^ Article 243(3) Archived 2015-03-21 at the Wayback Machine in Chapter 2: The Armed Forces. Part XII: Miscellaneous in the Constitution of Pakistan. ^ a b Article 41(1) Archived 2016-02-04 at the Wayback Machine in Chapter 1: The President, Part III: The Federation of Pakistan in the Constitution of Pakistan. ^ Article 46 Archived 2016-02-04 at the Wayback Machine in Chapter 1: The President, Part III: The Federation of Pakistan in the Constitution of Pakistan. ^ Article 243(2) Archived 2015-03-21 at the Wayback Machine in Chapter 2: The Armed Forces. Part XII: Miscellaneous in the Constitution of Pakistan. ^ Article 43(1)–43(2) Archived 2016-02-04 at the Wayback Machine in Chapter 1: The President, Part III: The Federation of Pakistan in the Constitution of Pakistan. ^ Article 50 Archived 2016-02-04 at the Wayback Machine in Chapter 2:The Parliament of Part III: The Federation of Pakistan in the Constitution of Pakistan. ^ Article 46 Archived 2016-02-04 at the Wayback Machine in Chapter 2:The Parliament of Part III: The Federation of Pakistan in the Constitution of Pakistan. ^ Article 54 Archived 2016-02-04 at the Wayback Machine in Chapter 2:The Parliament of Part III: The Federation of Pakistan in the Constitution of Pakistan. ^ Article 56 Archived 2016-02-04 at the Wayback Machine in Chapter 2:The Parliament of Part III: The Federation of Pakistan in the Constitution of Pakistan. ^ Article 243(3) in Chapter 2: The Armed Forces. Part XII: Miscellaneous in the Constitution of Pakistan. ^ Article 175A(3) Archived 2014-07-04 at the Wayback Machine in Chapter 2:The Parliament of Part III: The Federation of Pakistan in the Constitution of Pakistan. ^ Article 45 Archived 2016-02-04 at the Wayback Machine in Chapter 2:The Parliament of Part III: The Federation of Pakistan in the Constitution of Pakistan. ^ Article 248(1) Archived 2014-06-03 at Archive.today in Chapter 4:General of Part XII: Miscellaneous in the Constitution of Pakistan. ^ Govt. of Pakistan (3 March 2010). "The National Command Authority Act, 2010" (PDF). Islamabad: National Assembly press. National Assembly press. Archived (PDF) from the original on 5 March 2016. Retrieved 6 May 2015. ^ See: The XVIII Amendment to the Constitution of Pakistan. ^ a b c d Article 41(2) Archived 2016-02-04 at the Wayback Machine in Chapter 1: The President, Part III: The Federation of Pakistan in the Constitution of Pakistan. ^ Crilly, Rob (10 May 2013). "Pakistan election guide: How does it work?". Telegraph, Pakistan Bureau. Telegraph. Archived from the original on 14 February 2016. Retrieved 18 May 2015. ^ Article 41(3) Archived 2016-02-04 at the Wayback Machine in Chapter 1: The President in Part III: The Federation of Pakistan in the Constitution of Pakistan. ^ a b c d e f APP, Associate Press of Pakistan (25 July 2013). "706 Electoral College members to elect 12th President of Pakistan". News International, 2013. News International. Archived from the original on 2 August 2013. Retrieved 18 May 2015. ^ Article 44(1)-(2) Archived 2016-02-04 at the Wayback Machine in Chapter 1: The President in Part III: The Federation of Pakistan in the Constitution of Pakistan. ^ Article 44(2) Archived 2016-02-04 at the Wayback Machine in Chapter 1: The President in Part III: The Federation of Pakistan in the Constitution of Pakistan. ^ Article 49(1)-(2) Archived 2016-02-04 at the Wayback Machine in Chapter 1: The President, Part III: The Federation of Pakistan in the Constitution of Pakistan. ^ Article 49(1) Archived 2016-02-04 at the Wayback Machine in Chapter 1: The President, Part III: The Federation of Pakistan in the Constitution of Pakistan. ^ Article 47(1)-(2) Archived 2016-02-04 at the Wayback Machine in Chapter 1: The President, Part III: The Federation of Pakistan in the Constitution of Pakistan. ^ a b Article 47(3) Archived 2016-02-04 at the Wayback Machine in Chapter 1: The President, Part III: The Federation of Pakistan in the Constitution of Pakistan. ^ Article 47(5) Archived 2016-02-04 at the Wayback Machine in Chapter 1: The President, Part III: The Federation of Pakistan in the Constitution of Pakistan. ^ Article 47(6) Archived 2016-02-04 at the Wayback Machine in Chapter 1: The President, Part III: The Federation of Pakistan in the Constitution of Pakistan. ^ Article 47(6) Archived 2016-02-04 at the Wayback Machine in Chapter 1: The President of Part III: The Federation of Pakistan in the Constitution of Pakistan. ^ Article 47(7) Archived 2016-02-04 at the Wayback Machine in Chapter 1: The President, Part III: The Federation of Pakistan in the Constitution of Pakistan. ^ Article 47(8) Archived 2016-02-04 at the Wayback Machine in Chapter 1: The President, Part III: The Federation of Pakistan in the Constitution of Pakistan. ^ a b c d e f g h i j k l m Web Edition (30 July 2013). "Mamnoon Hussain elected 12th President of Pakistan". News International, president. News International, president. Retrieved 18 May 2015. ^ Waldman, Amy (January 2, 2004). "Pakistan Gives Musharraf Confidence Vote as President". New York Times. Archived from the original on May 15, 2013. ^ timesofindia.indiatimes.com "Pakistan presidential poll on September 6. "Times of India. 22 August 2008. ^ radionetherlands.nl Pakistan to choose president on 6 September. Archived 2008-09-24 at the Wayback Machine Radio Netherlands. ^ "Pakistan's presidential poll today, Zardari front runner." Archived 2009-01-03 at the Wayback Machine Times of India. ^ afp.google.com "Bhutto's widower set to become Pakistan president." Archived 2008-09-09 at the Wayback Machine AFP 2008. Accessed 8 January 2014. ^ nytimes.com "Zardari is elected Pakistan's president." Archived 2016-07-22 at the Wayback Machine New York Times 7 September 2008. 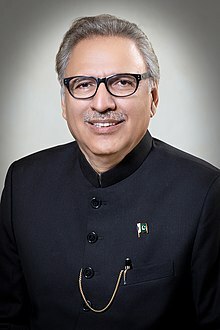 This page is based on the Wikipedia article President of Pakistan; it is used under the Creative Commons Attribution-ShareAlike 3.0 Unported License (CC-BY-SA). You may redistribute it, verbatim or modified, providing that you comply with the terms of the CC-BY-SA.